The sixth mass extinction of life on Earth is unfolding more quickly than feared, and amounts to a "biological annihilation" of the planet's wildlife, scientists have warned. 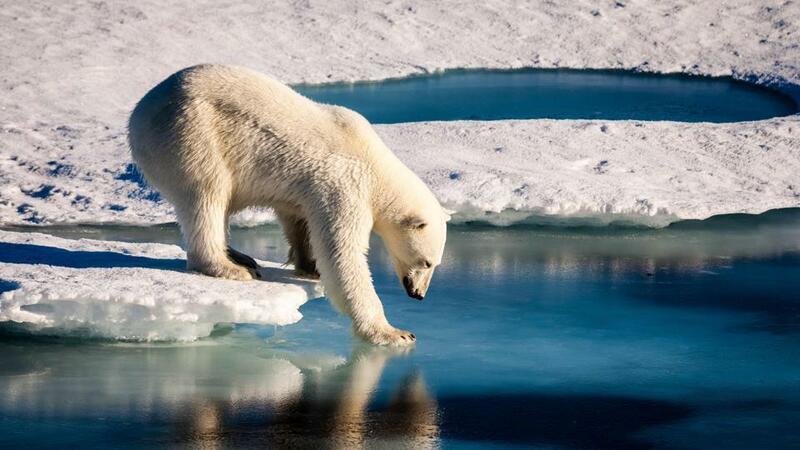 A polar bear tests the strength of thin sea ice in the Arctic. More than 30 percent of animals with a backbone -- fish, birds, amphibians, reptiles and mammals -- are declining in both range and population, according to the first global analysis of these trends. "This is the case of a biological annihilation occurring globally," said Stanford professor Rodolfo Dirzo, co-author of a study published in the peer-reviewed journal PNAS. Mammals have lost at least a third of their original habitat, the researchers found. Forty percent of those mammals -- among them rhinos, orangutans, gorillas and many big cats -- are surviving on 20 percent or less of the land they once roamed. The loss of biodiversity has recently accelerated, the study found. "Several species of mammals that were relatively safe one or two decades ago are now endangered," including cheetahs, lions and giraffes, it said. Globally, the mass die-off -- the sixth in the last half-billion years -- is the worst since three-quarters of life on Earth, including the non-avian dinosaurs, were wiped out 66 million years ago by a giant meteor impact. The study goes beyond extinction to map the dwindling ranges and populations of 27,600 species of animals, including 177 mammal types, between 1990 and 2015. Tropical regions have seen the highest number of declining species. While fewer species are disappearing in temperate zones, the percentage is just as high or higher. As much as half of the number of animals that once shared our planet are no longer here, a loss the authors described as "a massive erosion of the greatest biological diversity in the history of Earth." There is no mystery as to why: our own ever-expanding species -- which has more than doubled in number since 1960 to 7.4 billion -- is eating, crowding and poisoning its planetary cohabitants out of existence. The main drivers of wildlife decline are habitat loss, overconsumption, pollution, invasive species and disease. Climate change is poised to become a major threat in the coming decades, with some animals -- most famously polar bears -- already in decline due to rising temperatures and changing weather patterns.